Although Liverpool SolFed is still a small and very recent group, we were present at the May Day demonstration in Liverpool. A few comrades join the parade from Toxteth Library to St. Georges Hall alongside different unions and groups active in the area. The march was quite well attended and developed in a festive and protest atmosphere.SolFed group marched with a banner and giving out leaflets about our different campaigns. We informed particularly about the situation of Deliveroo riders and their disputes across the country. 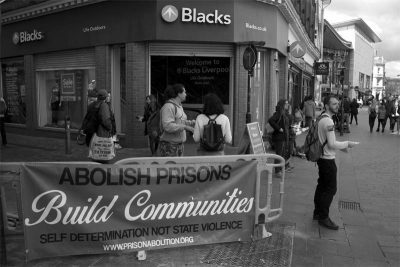 Once the march finished, we joined the comrades of the IWW to hold a picket outside the shop Blacks in Liverpool One. The action was part of a national campaign against this and other companies which benefit from prisons labour. Today as before, the 1st of May is an important date for the workers. It is a day to pay tribute to those who fought and fight for freedom and social justice and an opportunity (as good as any other) to show our anger, hang out together and celebrate the solidarity. We carry a new world in our hearts! Next Post Against work insecurity!